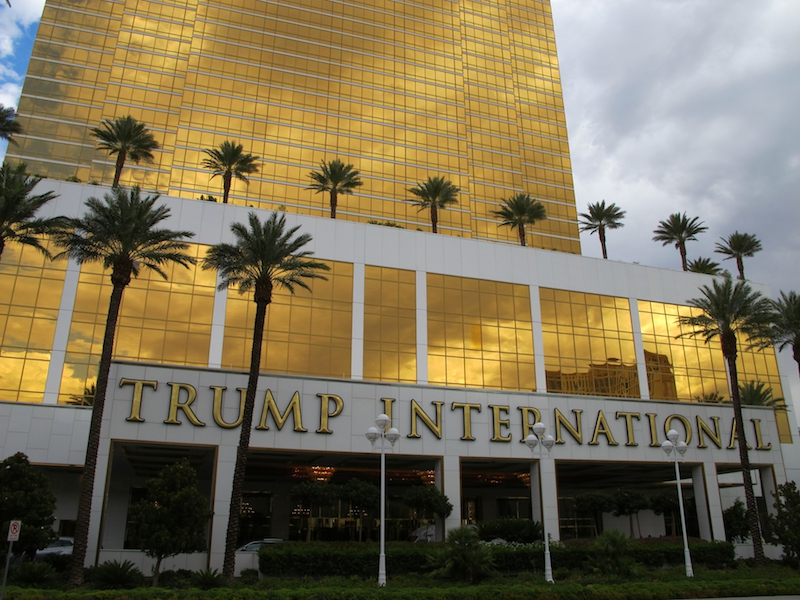 If you’re looking for 5 star accommodations at a 3 star price, the Trump Las Vegas is your place. Close to everything in the central part of the strip and just steps from the Fashion Show mall, you can’t go wrong. It’s also one of the few hotels on the strip that is completely non-smoking and has no casino. 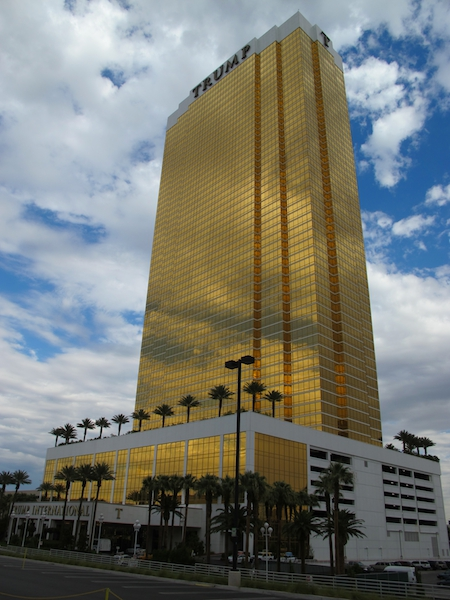 Location: The Trump is located about a block off of the strip, across from Nordstrom at the Fashion Show Mall. It’s less than a three minute walk from the Encore/Wynn complex. I-15 runs about a block behind the hotel. Rooms: Rooms here are perfectly sized and well appointed. Originally planned as a condo complex, all rooms have a small kitchen including stove,refrigerator, dishwasher and bar. 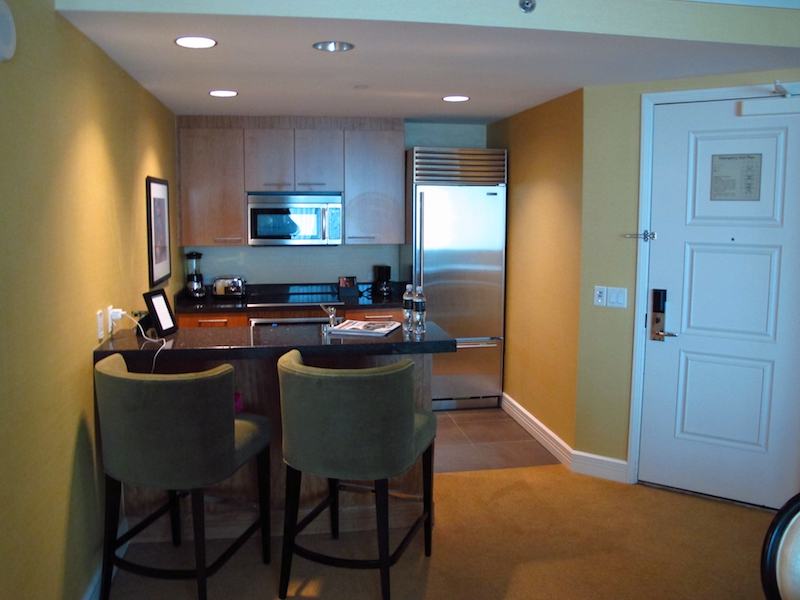 We stayed in a 1 BR corner suite that had views of the strip and downtown. Each corner suite has a small entrance foyer, small dining area with 4 seat dining table, corner sectional, flat screen TV and a small 3/4 bath off of the kitchen. 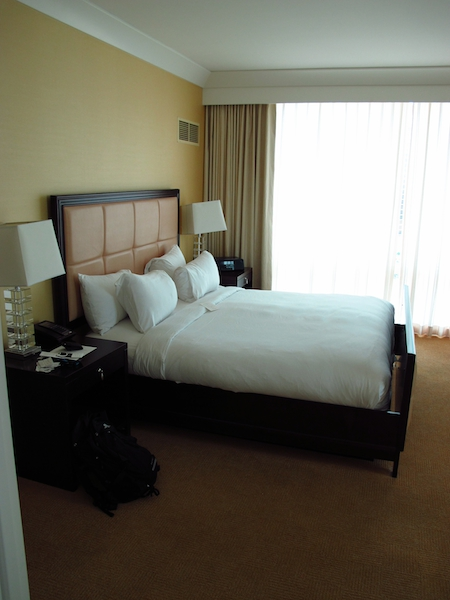 The large bedroom is separate and had two closets, along with flat screen TV and sitting area. The bathroom is huge. It’s almost the same size as the bedroom itself. 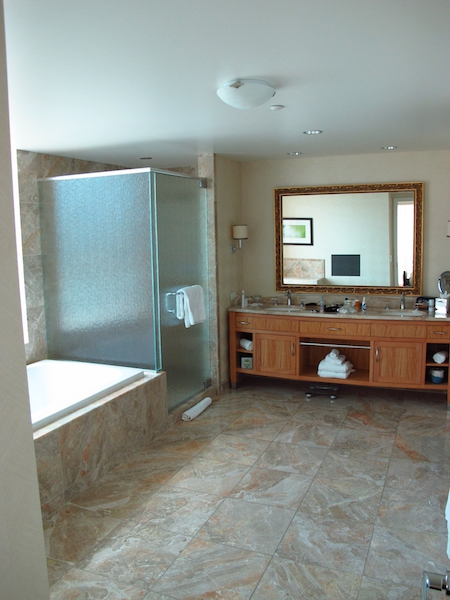 A large soaking tub with a large picture window, along with double sinks, separate shower and toilet areas give you a ton of space. Rooms were super quiet. If you want turn-down service, you do need to request it. Facilities: The hotel has a fairly decent size pool along with plenty of chairs and outdoor seating. A large exercise room with free weights and exercise equipment give you plenty of workout options. There’s also a small spa, along with a restaurant and bar. Your resort fee does include free wi-fi throughout the hotel. The entire hotel is non-smoking and there is no casino. 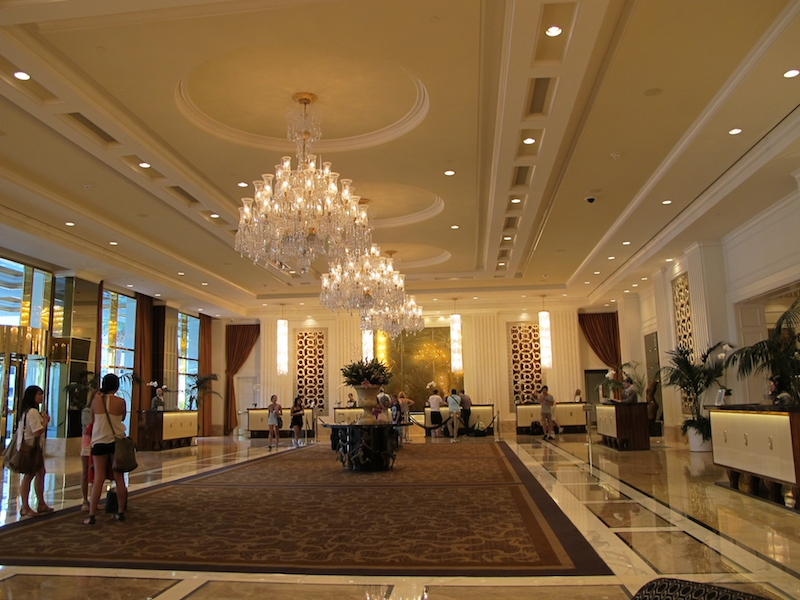 The lobby is huge and it’s very quick and easy to check-in and out compared to other properties in Las Vegas. Compared to other Las Vegas hotels, we never had to wait more than a minute for elevator service. Staff: Staff were great. They were always willing to assist. Doormen were quick to get taxi service as well as greet you when you return. Restaurant service was quick at both breakfast and lunch. 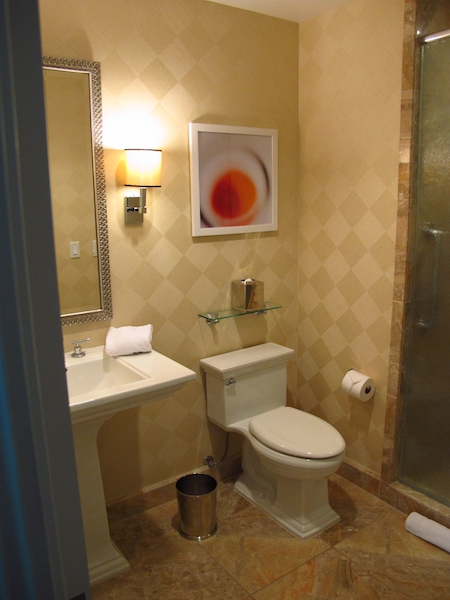 Pros: Great service, large rooms and great location on the strip. Entirely non-smoking hotel. Cons: There really aren’t any cons to staying at the Trump in Las Vegas. The only one that may be a “con” for some people is that there is no on-site casino. You can get better rates via the hotel website on stays of 3 nights or longer.